Have you ever been in a wheelchair? Have you ever spent time with someone else in a wheelchair? Is your salon wheelchair friendly? We see the handicapped parking spaces and we hear about places being handicap accessible, yet how many of those places allow full access to a person in a wheelchair? Having spent a little over a week in a wheelchair in January (an accident with my truck), it gives a completely different perspective to a lot of these questions. You also get to experience humanity in all its glory and its cruelty at the same time. It’s sad and entertaining in almost equal parts. Some people rush to get ahead of you, others will go as far as rushing to push the elevator doors closed so you don’t board with them while looking you in the eye. On the flip side, some will hold doors for you, ask if you need help, and generally restore your faith in humanity. Traveling in a wheelchair is an experience in itself. While friends and family are happy to extend help, others are happy to point out what a burden you are. At the Des Moines, Atlanta, and Houston airports, at least one person tasked with pushing the chair pointed out what an inconvenience it was and expressed annoyance that it was part of their job. Des Moines was perhaps my favorite. Standing and leaning on a cane on the jet bridge for 10 minutes, while it was below zero outside with the wind blowing through, a pilot personally goes to see why there isn’t a wheelchair. Finally the person pushing the chair to baggage claim has me in possession and proceeds to complain about how rude the airplane crew is, always wanting him to rush like he’s got nothing better to do. 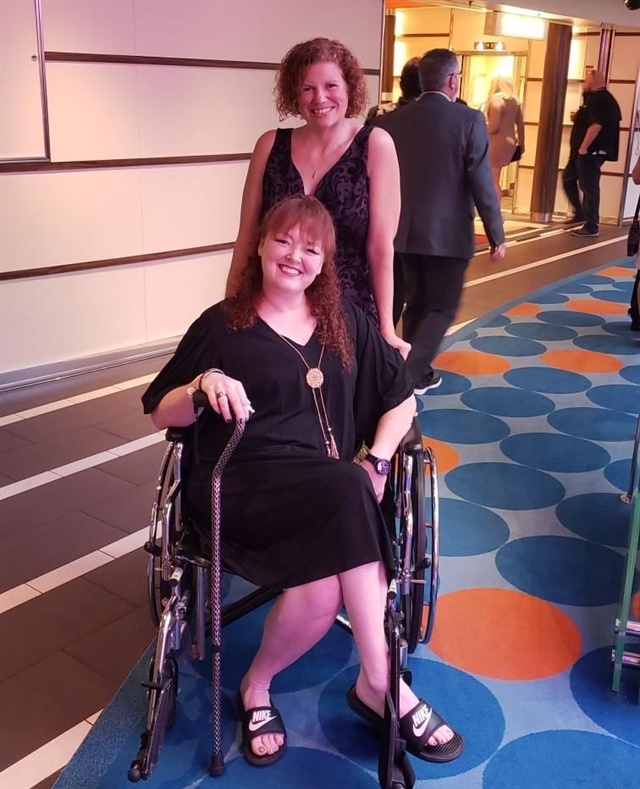 It was difficult not to laugh out loud, especially since the plane left point A and will arrive at point B in a pretty specific time frame, giving lots of advanced notice — and especially when the wheelchair service was booked a week prior! All of these experiences led me to wonder: How would our salons fare in the handicap accessible world? Could a standard wheelchair fit through the door to the salon? How about the bathroom? Can they get to it, or roll between the tables to get to a station? If you answers are yes, this is something you should proudly mention on your salon website, social media, in the window, etc. At some point, being in a wheelchair, you get frustrated with the places you can’t get to and just figure everything falls into that category. Imagine how much more likely you would be to make the effort to go to a salon if you knew they would be welcoming and you wouldn’t be embarrassed about getting the chair stuck in the door or banging into things. If you’re not sure how your salon would feel to a person in a wheelchair, borrow or rent one for a day. Have a friend or coworker tie your legs to the side bars on the chair so that you don’t just stand up to do something by accident, then navigate the salon. Go to where you would have your nails done. Is there an option for getting feet done in a wheelchair? Where is the checkout? Can the receptionist see and help you? Is the bathroom somewhere you can access and get the chair in, turn around, and get out. Is there a bar alongside the toilet to lift and steady with? Not all salons have the space or the ability to be wheelchair friendly. Some are in old buildings, some booth rentals are small rooms — there are a lot of unique circumstances. However if your salon has the ability to comfortably host someone in a wheelchair, this is a customer you could be completely missing out on simply because they are not aware you are an option!